I am absolutely in love with the sheer, delicate lace backing of this top! 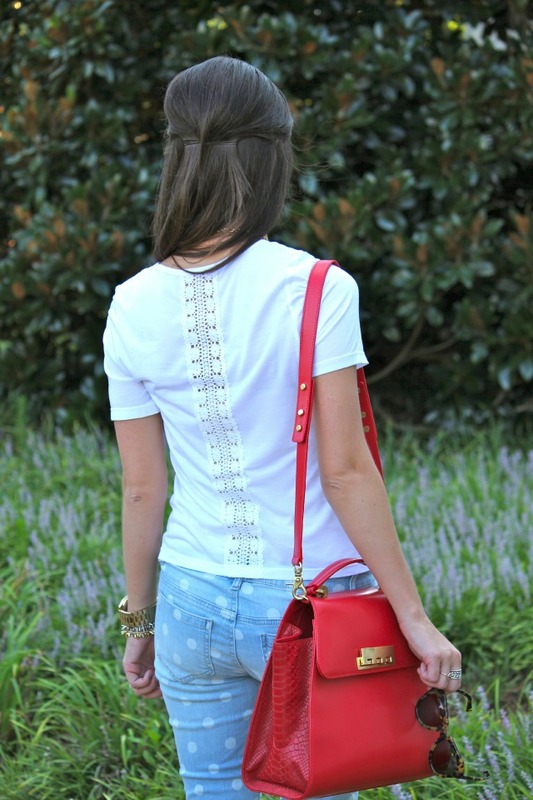 Plus, the polka dot jeans add a little extra fun to any outfit. In my opinion, you can never go wrong with distressed denim and a plain white tee for a casual look! Use promo code MEGAN50 for 50% off the PreSale Tees on www.lesfemmesvelours.com! 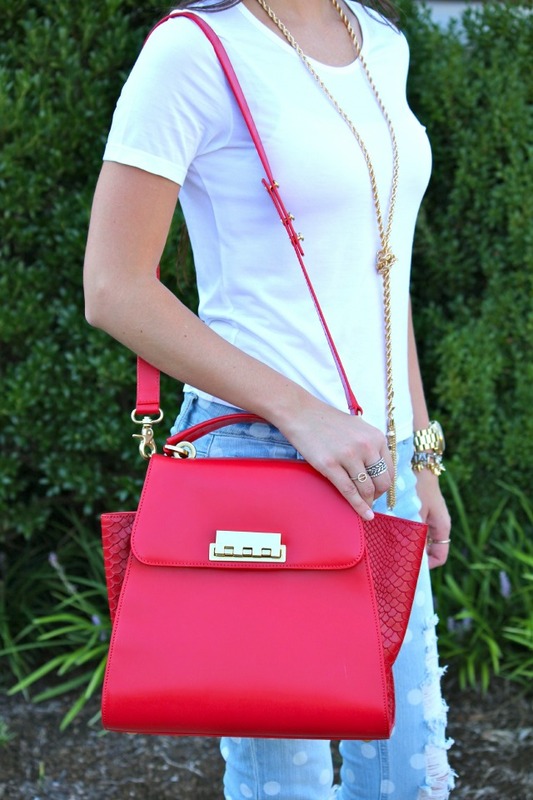 Love the pop of red with the more basic colors. Very cute! I love those jeans! Seriously, from Target?? Getting them! I love that outfit! Basic but the denim is fun... and from Target?!?!?! Amazing. Love those shoes and that top! LOVE everything about this outfit. SO cute. The jeans and the purse are so cute! I love how you paired some polka dots with some cheetah! Definitely working! You look fab. those polka pants are so cute!! love your purse!! Soooo cute!! I love those jeans...how fabulous and from Target??!! Amazing! The whole look is really fun and girly. Love it! 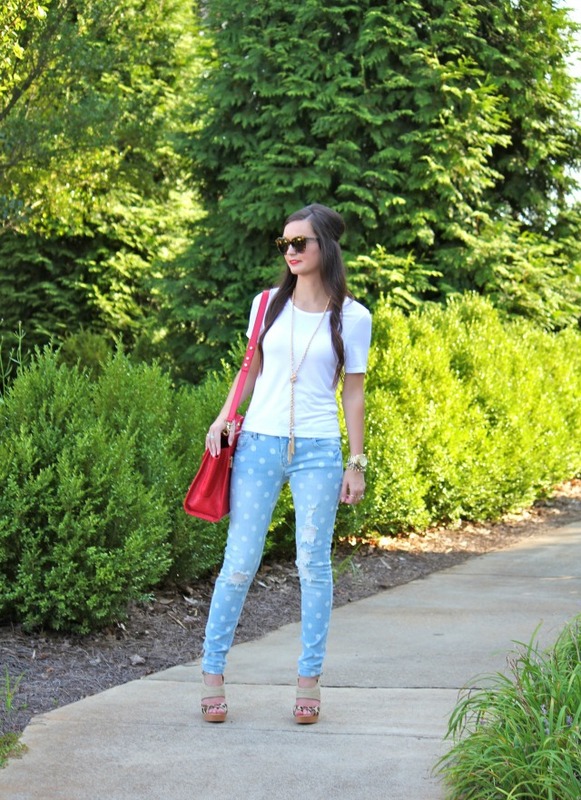 That polka dots jeans are stunning. Love the whole outfit. Love a casual look on you! And those shoes, stunners I tell you, stunners! Beautiful combo! Casual and fun but still girly.